then this article is just for you! 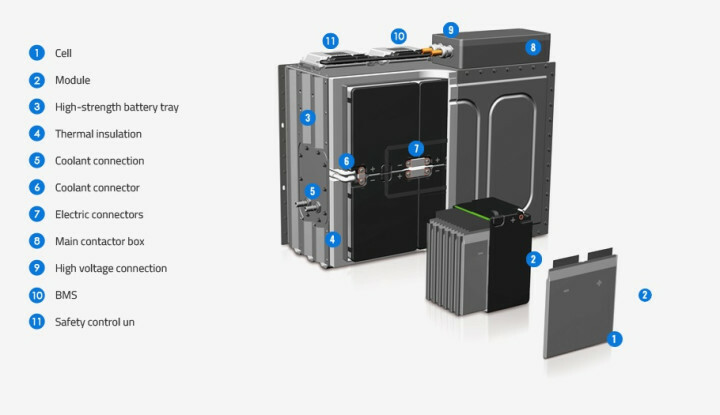 If ever you wanted to design a battery pack no matter its application, you should always clearly define what you want in a set of requirements. The four main requirements are the (minimum, nominal and maximum) voltage, capacity, weight, and power. Furthermore, you should always take safety features and regulations into account. Current battery technology seems to force us into a dilemma. For one, we can aim for a high-capacity battery pack that allows you to take more energy with you and therefore cover longer distances. Alternatively, we can build a high-power battery pack that’s more suitable to high-power applications and faster charging. Since the focus of InMotion is on developing fast-charging technology, our battery pack of choice is the latter. So, we are now developing a battery pack with a lower capacity than offered by some commercial vehicles. Still, this allows us to develop technology that can be used when battery technology has improved to a level where high-power battery packs provide enough capacity for commercial applications. As mentioned before, a battery pack is made up of lots of smaller battery cells. Several cells are bundled in a module, and these modules are then configured in a battery pack (see also Figure 1). The cell type is probably the most important decision in the process. It is the defining factor in the battery pack’s performance. InMotion uses pouch cells because they’re better suited for fast charging than cylindrical cells. They can take more abuse, usually have a lower internal resistance which in turn generates less heat, and they have a larger surface area which makes it easier to cool the cells. The design variables of a single module are determined by the free space required around each cell. With pouch cells the space above, below and on the sides of the cells are all parameters that need to be determined or acquired. These usually depend on the placement of the tabs and the type of cooling used. With the dimensions of the modules determined, they’re ready for stacking to make a pack. This will determine where cooling lines need to be run, as well as how the modules need to be connected electrically inside the pack. At InMotion the development stage is very dynamic. It allows us to change things on-the-fly. It also means that not all our requirements are set in stone, and we’re trying to find a set that fits our goals. The battery pack is a good example of this as it can be configured in literally a million ways. But how to find out which configuration works best? 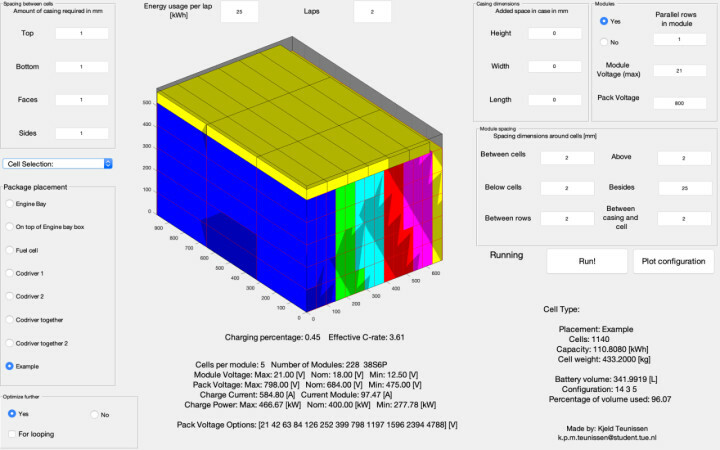 To avoid having to generate a model for every single configuration, I have made a battery pack configurator that optimizes the pack for different input parameters. To ensure ease-of-use and to allow the user to try out different configurations without having to understand the underlying code, I created a GUI (see Figure 2). It basically takes all the design variables as input and then tries to fit as many modules in a given space, stacking them in the same direction. In the space that’s left, it will once again try to fit as many modules as possible, even if that means the orientation of some modules is different than that of others. The script uses a heuristic method rather than an analytic approach to this space optimization problem. This is done because it is easier to write and still reaches local minima. It is also extremely efficient and fast. On an average PC the script creates 190 optimal configurations, selects the best for a given set of preferences, and plots it within 5 seconds. Within this time it also saves all created optimal configurations, allowing them to be filtered for different preferences. If a different configuration turns out to be better, it’s easily plotted using the GUI. the voltage difference between a full pack and an empty one. Additionally it calculates the charging currents while indicating the heat generation as well as the charging power range that will be necessary to charge the pack in 7.5 minutes. With Electric Refueling we aim to be able to charge an electric car in just a few minutes. If successful, it will undoubtedly accelerate the energy transition from petrol to electric in the automotive industry. To show the world how fast electric racing can be, we have created the “Fusion”, an electric formula car that currently holds the electric lap records at Circuit Zandvoort, TT Circuit Assen (both in The Netherlands) and Circuit Zolder (Belgium). Our concept car “Vision” is the true embodiment of future electric mobility. It is designed to be 10 times more aerodynamically efficient than a Formula 1 car. It is truly the endurance racer of our dreams. Is your team working on something cool? Are you on a student team with a cool or amazing achievement to report on in the field of electronics? Then email editor@elektor.com, subject “Student Demonstration Time”.